As suggested by Blue Lightning: LED for Gallium instead of Germanium who is now represented with a microscope. The old microchip for Gallium, represent Arsenic instead now. Made another variation to the radioactive-icon, so there is more to choose from. J is from the first version (K), but with a black dot in the middle (thanks to the commenter's). A to I is the new ones. They are all the same with different colors, except C who also have added transparency to the far out parts of the rings. 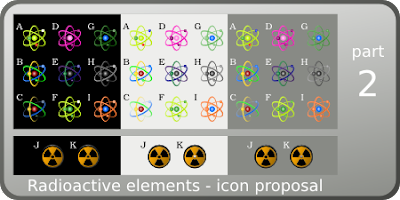 Since many elements is going to be represented by the radioactive-icon, I may try out more ideas later. 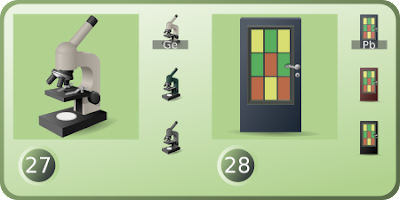 Sorry, what is the connection between germanium and microscopes? Germanium is used in lenses for night-vision cameras, wide angel camera lenses and objective-lenses for microscopes. Truth is, anyone who needs an icon for Germanium won't know the connection. The most important elements to cover are the ones which people already know. Also, I think J is the best "radioactive" symbol because the totally new ones (A-I) are too generic and could be taken to mean pretty much anything. There is planed to show explanatory text to the icons in Kalzium to show the connections with the elements. Great story you got here. I'd like to read more concerning that theme. Thanks for posting this information.